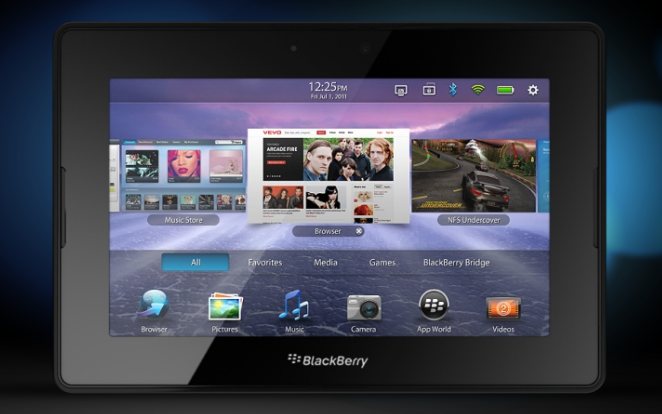 Remember the Blackberry PlayBook? Yeah well, prior to it’s release way back in April, RIM spilled the beans on what seemed like a really neat feature… the ability to run Android applications on the device thanks to an application called the Android Player. We covered a demo of this functionality that RIM showed during Blackberry World back in May, and we were genuinely impressed with how it seemed to work. Some 5 months after the launch of the Blackberry PlayBook, not only has the Android Player not even been released, but new details tell us that it’s going to be much less impressive than we were initially led to believe. Not only are NDK-built applications off-limits for the Blackberry Playbook’s Android Player, but so are any applications which rely on Google Maps, text-to-speech, in-app purchases, or the cloud-to-device messaging system that you’ve seen used with Google’s Chrome to Phone extension. 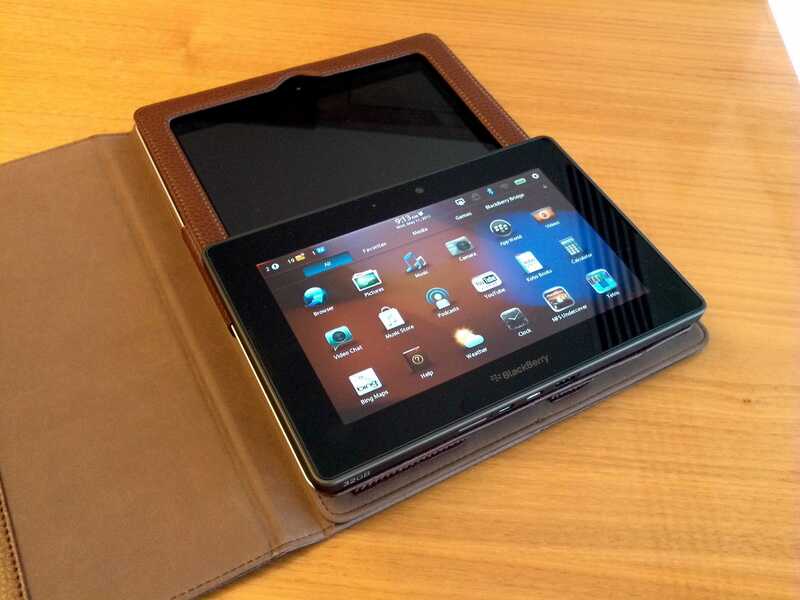 Blackberry’s PlayBook launched to much fanfare, but was cut down pretty quickly by reviewers for having missing features… you know, like an email client. After failing to gain much traction, thoughts of RIM exiting the tablet market are starting to crop up, definitely not a good sign for a company that is already widely regarded as behind the times in its once thriving smartphone lineup. Among the devices listed are the Motorola Droid Bionic (I accidentally didn’t note it as being 4G), which has seen a number of delays, and the Motorola Xoom 4G upgrade, both of which we had already heard were coming in September, so corroboration makes this leak seem quite legit. The Droid Bionic and Xoom were part of Verizon’s early 4G lineup, so we already knew they were coming down the line. The ones listed above, however, are mostly new. I say mostly because we’ve been eyeing the Galaxy Tab 4G which, at first, was announced as a 4G version of the original Galaxy Tab 7, but it may end up being the Galaxy Tab 8.9, instead. Verizon had it listed as the “P8 inch on the leaked chart, but it is unclear exactly what that means. Whichever form it comes in, the leak tells us that it’ll be happening sometime in November. The HTC Vigor is specifically designated as being a replacement for the HTC Thunderbolt which was Verizon’s very first 4G device. Similarly, the Revolution 2 is going to replace theâ€¦ wait for itâ€¦ Revolution (bet you didn’t see that one coming! ), which I’m hoping will provide better battery life, faster charging, and better standby than the original. 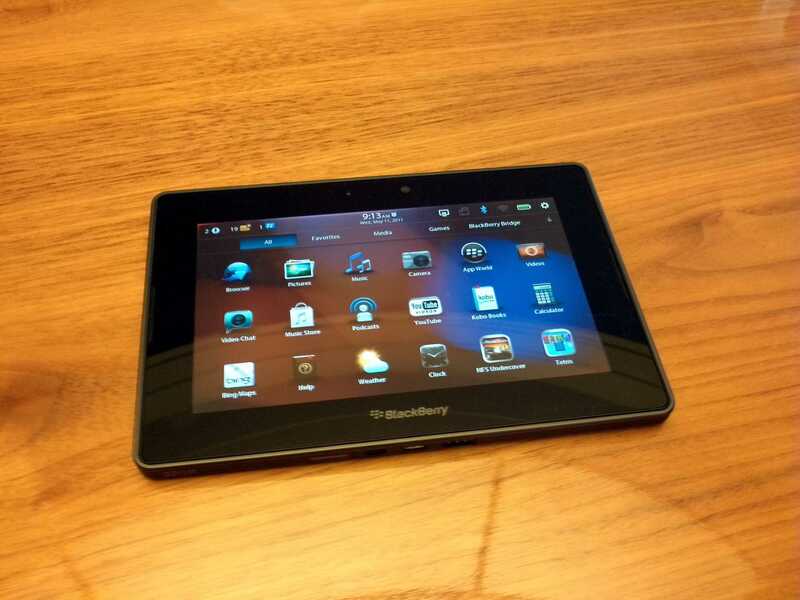 The Blackberry PlayBook is also listed on the leaked list, but its launch date is listed as â€œTBD inch. What’s obviously missing here is any information regarding the iPhone 5 or iPad 3, but any information regarding those devices is unlikely to be known outside of Apple until they announce it publicly. Still, that doesn’t stop us from speculating. If all of this turns out to be true, Verizon has a powerful pre-holiday lineup; I can only hope that the other major carriers have such an exciting group of devices ready to go! I say mostly because we’ve been eyeing the Galaxy Tab 4G which, at first, was announced as a 4G version of the original Galaxy Tab 7, but it may end up being the Galaxy Tab 8.9, instead. Verizon had it listed as the “P8” on the leaked chart, but it is unclear exactly what that means. Whichever form it comes in, the leak tells us that it’ll be happening sometime in November. The HTC Vigor is specifically designated as being a replacement for the HTC Thunderbolt which was Verizon’s very first 4G device. Similarly, the Revolution 2 is going to replace the… wait for it… Revolution (bet you didn’t see that one coming! ), which I’m hoping will provide better battery life, faster charging, and better standby than the original. 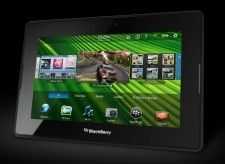 The Blackberry PlayBook is also listed on the leaked list, but its launch date is listed as “TBD”. I managed to get a few hours hands on with the Blackberry Playbook [tracking page] today. First impression out of the box was: Wow, it’s tiny. Laptopmag has done a comprehensive review of the device and they are pretty much on the money with their assessment. I didn’t experience any of the software issues they had though except for the slowness to rotate the screen when I turned the device. The form factor is very similar to the Samsung Galaxy Tab and as you can see in the picture it’s roughly half the size of the ipad 2. I actually found the square design refreshing and it definitely looked and felt different to the other rounded edge tablets. The unit felt solid and well built. The PlayBook has a soft-touch almost rubberised back and this gives a nice grippy surface to hold onto. It was easy to hold in one hand and light enough to do so for an extended period of time. 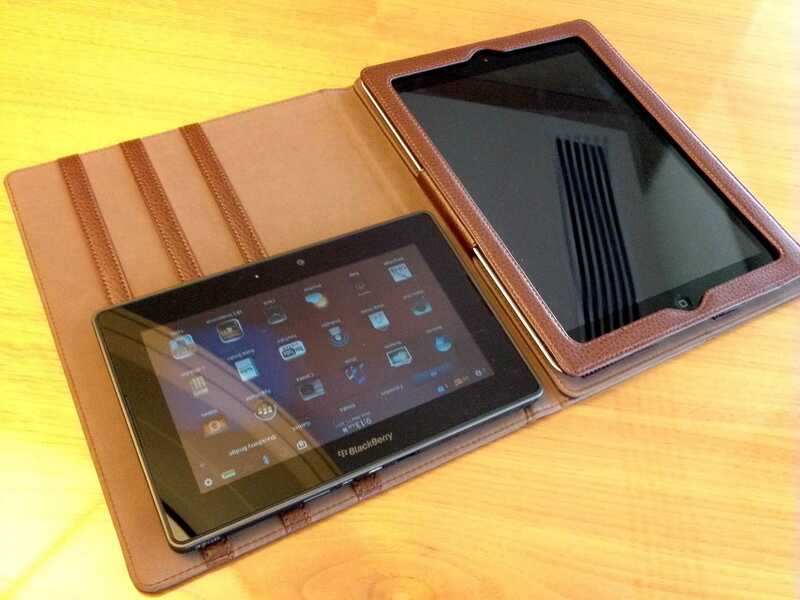 The Playbook measures 7.6 x 5.1 x 0.4 inches, and is thinner than the Samsung Galaxy Tab but is slightly heavier. It has a 7 inch display but interestingly the bezel forms part of the touch sensitive surface of the screen and allows gestures that make the tablet do things. For example you can swipe up from the bottom of the screen to return to the home screen. The gestures were easy to learn and remember, and I picked them up and was using them naturally very quickly. There’s a 3-megpaixel camera above the screen, along with a notification LED. There’s also a 5-megapixel camera on the back and the quality from both was very good. Two small slots on each side of the display are the speakers and they were surprisingly good in the quiet room. The top of the PlayBook has a power button and volume controls with a Play/Pause button as well – a neat feature for media. A headphone jack is on the top right. The device also has a micro-USB port which allows connection to a PC as a hard drive for file sharing. This worked as advertised and almost made up for the lack of a full sized USB port. As long as you have the cable it will be pretty easy to get files onto the device. A micro-HDMI (D-port), and charging contacts for an optional charging dock (no extra ports on the dock) are located on the bottom edge. The unit will charge from the supplied adapter or via USB when plugged into a computer. 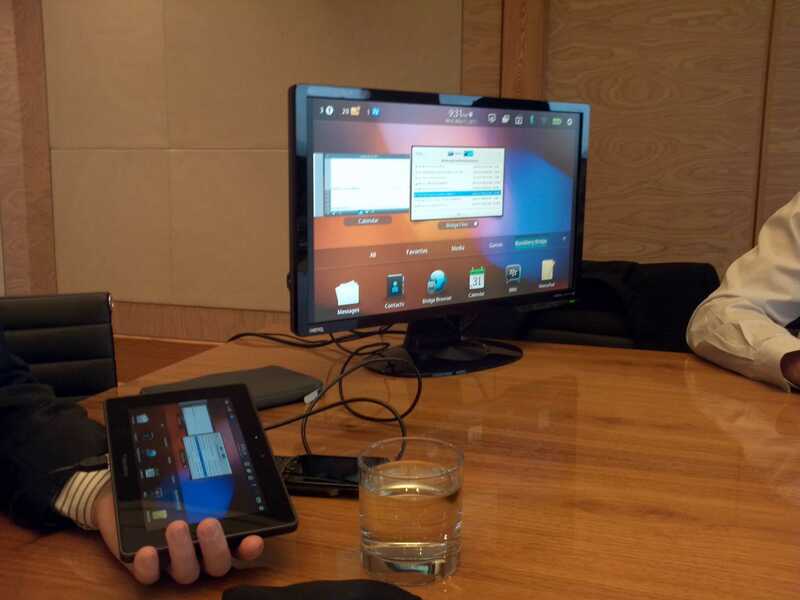 Output from the HDMI was good and allowed full HDMI mirroring as well as presenting mode which meant you could be sending an image, slideshow or video to an external monitor while using the tablet for other tasks. An interesting option in the settings was for the power management. This affected the multi-tasking capability. The options are Showcase, Default and Paused. On the homescreen if you swiped to switch between apps the running apps became smaller windows. Each app continues to run in these windows demonstrating that the OS is multi-tasking these apps and switching between them was ast and smooth. 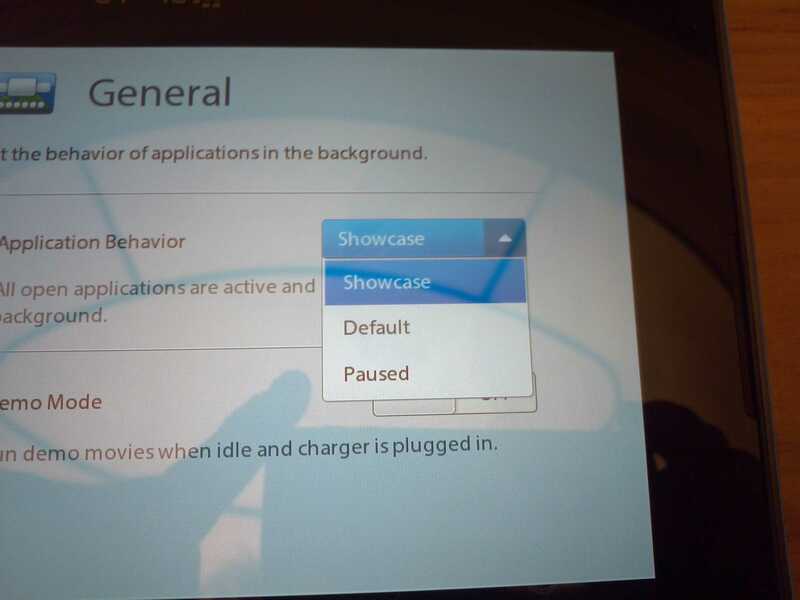 In the showcase power setting the apps still operated in the windows and this was demonstrated by showing a video still playing in the smaller window and while flicking the app selector left and right. This is obviously the most power hungry setting. In Default mode the setting employs smarter power management and in paused mode every app pauses it’s behaviour automatically when you navigate to another app. Connecting to the Blackberry phone was simple and I tested out the Blackberry Bridge function as well as 3G tethering. The Playbook is WiFi-only and therefore doesn’t have a 3G capability without tethering to your Blackberry phone. Using the browser over a 3G tether was slow and even with a good 3G signal it then had to travel over Bluetooth which may be the bottleneck. Accessing email, files, and calendar functions over the bridge connection was easy but when opening larger files I really felt the slowness as it could take 20-30 seconds to open a 3MB PDF. I think I would use the bridge connection for email as having a larger screen and big on screen keyboard is much better than the small phone screen but for reading larger word documents or PDF files I would have to download them before attempting to read as otherwise it was just painful waiting for the pages to render. The RIM sales represtative also mentioned that they will definitely be releasing a 10 inch version within months and hinted at some special features on it but refused to reveal what. While I prefer the small, pocketable size of a 7 inch device I know guys in my organisation prefer a 10 inch screen so the playbook 7 inch will not get a lot of interest from my co-workers. I feel that RIM has realised this barrier to entry in the enterprise business market and that’s why they are releasing a 10 inch version. Overall the Tablet was well made, had lots of processing power and felt like a well rounded unit with a good mix of features. 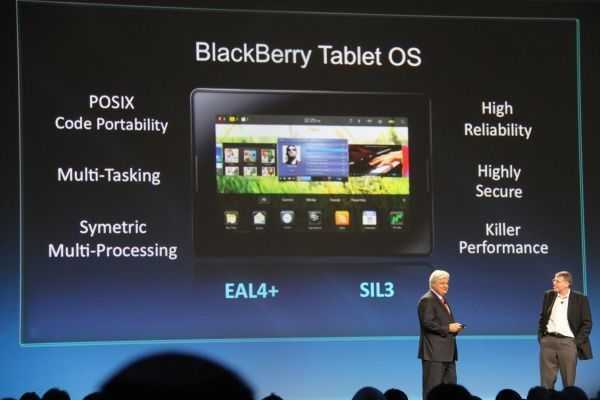 At the BlackBerry World 2011 conference, RIM demonstrated its upcoming Android Player application which will allow PlayBook [product page] users to run Android applications. This could be the gambit that RIM needs to get up to speed in the app sector while seamlessly enhancing the user-experience. The integration here looks rather seamless. I was assuming that things would get confusing for consumers because of the difference in controls between native PlayBook apps and Android apps, but according to these fellows, the gestures (menu and home button) are mapped identically between the two types of applications. This means that users will be able to use without having to think about whether they are native PlayBook apps or those that were originally intended for Android. This also means that Android developers can create a single application then distribute it to the PlayBook and Android devices; a win-win-win for consumers-developers-RIM. 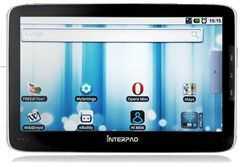 Android applications on the PlayBook won’t be restricted to those who know how to sideload applications. RIM says that Android apps will be distributed right from their very own BlackBerry App World application store, providing ease of use for the consumer from instillation to operation. Sadly, RIM’s PlayBook launched before this functionality (and arguably even core features) was ready for prime-time. The Android Player is slated for release some time this summer. The sooner the better, I say. 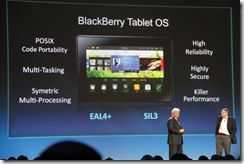 RIM are showing a new product, the Blackberry ‘Playbook’ at DevCon10 in San Francisco as I write. I’m adding specifications as they come in. Slashgear have some more images from the event here. More (official) specs now in the product page. Image set now in the gallery. This is being pitched as a stable, secure platform with ‘uncompromised browsing.’ Flash 10.1 is included. Stay tuned here or on the product page for updates. Blackberryplaybook.com is redirecting to Blackberry America. It will be offered as a partner device for blackberry owners for a very cheap price, a ‘value-add’ upgrade. Web support is being promoted heavily with Flash and HTML5 support and a “high-fidelity web experience”. Could the browser be better than the iPad and Android devices? At 400gm with a Cortex A9 ARMV7 Core (Thx TheLukeTailor in comments), the battery life probably won’t beat the iPad. I estimate something similar to the Galaxy Tab – 4-6hrs online usage with good standby capability. Mobile usage will depend on the tethered phone. Storage is said to be 16GB which is a good starting point. No word on removable storage capability yet. Application ecosystem needs to be analysed. That’s it for this post. More soon so stay tuned for analysis. It’s something we’ haven’t reported on before despite all the rumours but today could be the day that changes. Blackpad is the rumored tablet product from RIM and although no official word is out on the specs, many commenters feel confident that it will be a 7 inch tablet running software from QNX, a company that RIM bought in April of this year. Other information indicates that it will run on a Marvel platform. Seeing as this is RIM, there’s likely to be a productivity and security slant which will pitch the solution right next to Windows-based tablets (which is why we’re reporting it here on UMPCPortal.) The design is likely to be thinner and lighter than current Windows tablets and UMPCs (take the Viliv X70 EX as an example of a current Windows-based 7 inch tablet) so if RIM can grow a range of serious, well-engineered and supported applications over the next year the Blackpad certainly has a chance. Without 3G, it’s likely to be relatively cheap and easy to approve too, potentially making it the de-facto accessory for all Blackberry owners. Rolling a Blackberry phone and Wifi-Only Blackpad tablet up into a neat carrier deal shouldn’t be too hard at all and we suspect that’s where RIM are going with this. Don’t expect a cool gaming or entertainment device but do expect something that can be used for more than just emails and that could be a no-brainer add-on for a Blackberry owner. As for the keyboard we suspect ‘no’ but we hope to be surprised. If news breaks today, check back here for details, product page, analysis and discussion. Outlook – Handheld Computing Products August – Sept 2010. I’ve just posted a two-part article over at UMPCPortal that looks at some recent news, looks forward to some expected products, highlights some events in September and provides a general update of where we are today in the mobile handheld world. Much of it focuses on consumer products that you readers of Carrypad are interested in. In the article I talk about the Huawei S7, RIMs Blackpad, Samsungs tablet, the Smartbook Surfer, Interpad (new in the database,) Eking, the Huawei E583C hotspot, ICD, Notion Ink and a bunch of devices that are on our ‘watchlist.’ We’re also going to IDF and IFA events in September so you’ll see some information about that too. Report, Uncategorized Comments Off on Outlook – Handheld Computing Products August – Sept 2010. Outlook â€“ Handheld Computing Products August â€“ Sept 2010. Report Comments Off on Outlook â€“ Handheld Computing Products August â€“ Sept 2010.